in the midst of the Olivia Lum story, let’s not forget the Linas of this world (Please forgive me, Lina, for my previous writings). I also know two members of New Creation who used up all their life savings in the pursuit of this wonderful stuff. I’m related to one of them. One, as of last week, in his mid-forties just closed up his restaurant and said he has zero in his bank account. May His will be done in all situations. When one can monetize God, there is a fatal flaw in the belief system that can and will be exploited by many “professed people of God.” From the around the world many mega pastors have been indicted and convicted. @ lyn …….What was it about Lina.??? Our salvation towards heaven and reconciliation with God the Father is justified solely by our faith in Jesus the Christ/Messiah/Savior; …and NOT by the works of keeping Moses Law, either fully(=by Jewish Christians) or partially(=by Gentile Christians – ACTS.15:29). Notwithstanding this “non-workable” fact about salvation, the works of keeping Moses Law, are still very important for our lives on this earth, ie for the blessings or curses/punishments of God(DEUT.28, ROM.6:23, GAL.6:8). …….Bear in mind that our salvation will only come into effect when we die and leave this “rotten” earth – hence the Cross and the Resurrection. The Radical Grace or Hyper Grace teachings tend to cause their followers to be nonchalant or flippant about their willful sins/evil-deeds(=bad works) and over-confident about their salvation in-Christ. This may result in them being cursed/punished by God for foolishly and willfully committing sins, which may cause a few to lose their faith in Christ, eg the suffering wife of Job cursed God and died or like Judas Iscariot who was too ashamed of his sin of greed and betrayal of Christ to keep the faith. …….Hence, the warning of Jesus to a few early 1st-century Gentile Churches about their sinful/evil works(deeds) at REV.2-3 & 22:14-15. At MATT.7:15, Jesus has warned His people about false prophets/pastors coming to them in sheep’s clothing(=pretending or assuming to be ‘hearing’ and heeding the voice/Word of God) but inwardly they are ravenous wolves, ie ravage their Church-members financially, emotionally, sexually, etc. …….This is similar to foolish investors being conned by the masterminds of Ponzi or Pyramid schemes, Genneva Gold scam, MLM/Direct-selling or insurance/lottery ‘businesses’, Bitcoin craze, etc. Wise and big companies do due-diligence studies b4 they buy up a small company; prudent banks do credit history checks b4 they give out loans; careful girls do background and family history checks b4 they marry, etc. So, wise Christians conduct biblical checks on pastors b4 trusting them or following their teachings. The ministry Of Jesus is mostly about salvation or everlasting life in the after-life(=not about life on this earth). …….The former is a heavenly blessing(=faith in things that is not seen, eg our resurrection in-Christ – HEB.11:1) while the latter is an earthly blessing(=faith in things that will be seen on this earth, eg in general, prosperity or good health thru good works – Abraham & Job). 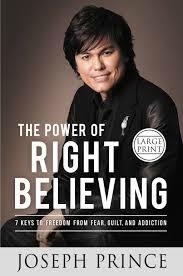 I think some of the teachings of Ps Joseph Prince in this book are half-truths, do not jive with the laws/Word of God or are non-biblical. P S – Do not be like (rotten-)Apple’s Steve Job – an ‘evil’ dictator-boss. Hello is it God’s plan to fail Hyflux after much endorsement by Joseph Prince? Joseph Prince, Kong Hee, Benny Hinn, Joel Osteen, Joyce Meyer, Bill Johnson, Brian Houston (Hillsong), Todd White, Crefo Dollar, Kenneth Copeland………and many many more are erroneous Word of Faith (WOF) preachers , they teach the Prosperity Gospel where they teach that God wants you to be always healthy and wealthy. This is not Biblical (look at poor Apostle Paul who was so poor he needs to work as tent maker). Check out the recent interview of Costi Hinn (the nephew of Benny Hinn who was working for his uncle and his ministry for years. He exposes the tricks and fakes of the WOF movement. He spent 30 years with his uncle and could only think of 1 miraculous healing , the rest you see on stage is mostly not verifiable or temporary. These pastors live a extravagant lifestyle reaping the tithes of God’s people. Many people has wrecked their lives following these pastors. If they are so good at healing , they should setup a Christian Hospital and heal all sick Christians. Some of them even call themselves apostles, some claim they speak to God (Joseph Prince does). Thank you for your comment. You have highlighted some teachings you found erroneous or extreme. We should not lump the above ministers together. There are some fine differences. Thankfully we have a God who knows all and sees every motive and intentions of the heart. On that day each will receive His due. In the meantime, let us be suspend sentencing and pray for each of them. Many of the above persons have been used by God to win thousands of precious souls to Christ, and to build up His people in some precious ways. There may have been things they preached and practiced that has triggered controversy, disagreement and accusations. These can be debated with more light and love and respect and less heat and flame throwing. We are all flawed people after all, trying to show other flawed people where to find bread.